It was late March, 2013. A middle-aged man residing in San Francisco, California sat down at his computer to graciously provide the good people of the world with a forecast of the Major League Baseball season that was soon to come. This man, only just a mortal man, and no prophet, believed in things – nay, could see things. Perhaps, as is surely apparent now, this man could in fact see things that others could not. This man looked at all the conventional wisdom of his day, and while absorbing some and discarding much, made bold prognostications that were devastatingly prescient, while being stupendously unconventional. The man picked the Boston Red Sox to win their division, the most difficult division in baseball – for instance. That baseball team is now in first place in that division. This same man believed in the Atlanta Braves, a team beloved by no man in March 2013, and a team currently in first place in their division as well. It is no mere accident that I know so much about this man and his ways, my friends – for I am that man. Sports Illustrated recalibrated their World Series predictions in their new issue, so I guess that gives the rest of us license to do the same. They have St. Louis beating Texas at the end. I'll stick with my World Champions-to-be the Atlanta Braves, this time beating the Detroit Tigers in 7 games instead of beating the Anaheim Angels of Los Angeles, who will miss the playoffs and suffer an offseason of acrimony, finger-pointing and bitter recrimination. 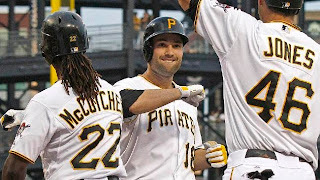 Like you, I'm loving the Pittsburgh Pirates story. For a big part of my youth, they were a dominant team, but the last time they were any good, we were all 21 years younger. I had thought that the big surprise story this year would be the Kansas City Royals, and in some quarters, it's a big surprise that they're not contending. A little piece of every baseball fan will die if the Pirates collapse in the second half, and don't at least finish with their dignity intact and their first winning record since 1992. Is that too much to ask? My San Francisco Giants, currently 8 games under .500 and yet only 6.5 games out of first place, will do one of two dramatic things in the next 3 months, all without making the playoffs. I'd give them about a 60% chance to actually have a worse second half, and to get to a "rebuilding" mindset about 6 weeks from now, if not sooner. As baseball becomes a sport of prospects in their 20s, as opposed to a sport of expensive free agents in their 30s, look for the Giants to embrace the new trend and start selling off parts (Pence, Lincecum, Romo and so on) in favor of stocking the farm. Then again – there's a 40% chance they start playing really, really well, far better than their mostly-abysmal first half, just enough to contend for second place or a strong third, and call it an odd-year aberration on the way to their third straight even-year World Championship in 2014. I'm also looking forward to the Great Steroid Bust of 2013. Any day now, Major League Baseball is going to announce who's in trouble from the Biogenesis scandal. Clowns like A-Rod and Ryan Braun will be suspended, most likely for a long time, and even their own union has proactively announced that it won't defend them. It's clear that the players, the grand majority, are looking to move on from this story and the taint that comes from it on their own steroid-free performances. Who among us isn't looking askance at Chris Davis, rightly or wrongly, for instance? I'd like for this whole thing to be gone, with the dopers swept out for good and playing field metaphorically leveled again. Can the Oakland A's keep playing this well? Man, I hope so. I've actually been to more A's games this year than Giants games, and all of a sudden it's just a fantastic atmosphere over there in the disgusting, decrepit Oakland Coliseum. I haven't seen such excitement and fan unity & cohesion since the BillyBall days. They're a fun team with what appears to be a terrific set of individuals for the second year in a row, and my dream Series is them vs. the Pirates this October. Hedonist Jive's favorite ballplayers, as of July 2013, in no particular order (see my 2010 list here – it's funny to see how many of those guys are out of baseball, on different teams, or just flat-out stink now): Andrew McCutchen, Pablo Sandoval, Paul Goldschmidt, Mike Trout, Freddie Freeman, Jacoby Ellsbury, Alex Gordon, Yoenis Cespedes, Aroldis Chapman, Chris Sale, Yu Darvish, Shelby Miller, Madison Bumgarner, Tim Hudson, Craig Kimbrel, Grant Balfour. Why? I don't know. I like these guys, the way they play the game and stuff. See you at the end of the season, when we do our annual post-mortem and hand out some hardware!